This is not about the home on your website or the physical home where we rest our bodies. I got the above gibberish when I shifted from my home position on the keyboard, F and J where I rest my index fingers. When I move away from my home position, this is the result that I get. When I am at home on the key-board I make sense else I make non-sense. I can use appropriate levers and leverage to move the whole world, improve. If I am not at home, positioned, I create waste, work very hard, feel stressed out, burn myself faster and hurt myself and others in different ways. Work anyway is not fun. We unmake the world rather than making it. This is the work we work on, overtime. Home is the only place from which I can move the world. Even if we are homeless we have homes on websites. When we go off course, we can refer back home and continue to navigate. We understand reality through our tools. It is a long time that I have used a pen or pencil or paper. I spend most of my working time in front of the monitor. The PC is my most used tool. When we were hunting and gathering, we would have used more of our hands and feet. With settled agriculture, we became more attached to a physical location so did our mental maps of the world. The fishermen are quite different. On the high seas they don’t have the kind of stability that we on land take for granted. Their mental models are different from that of the farmer. They use the compass or GPS since it is much more disastrous if they cannot locate their position/s. They could drift off and never return home. Do we have a vision compass for the more important journey of our life ? When we got ‘educated’ we became language and ‘English centric’, says, Wanderer, my friend from an earlier social network which was home to these blogs. What do you mean by being English-centric?. Wanderer (UK) adds, your language is Inglish, not English. I admit. He is a veteran senior and has wandered around far more than any of us. The paradigms are changing as HTML, visual and the mufti modal replace text as we used to know it. One is lucky if we manage to retain a wiki page for a life-times work. Technology helps us to see reality as it unfolds. Reading gives way to browsing and if one wants to capture the flea span of attention of the viewer, one has to be multi-modal. It is quite unlikely that the essential message is grabbed from all the noise about unmaking the world since the deep structures that influence comprehension of reality remain unchanged. We need a ‘Babel fish’ to reduce the noise and help navigate the semantic swamps and to connect across divergences and barriers created by language and tools . In our times we have become less earthbound in our internal and external horizons. We cover much more distance in a day than ever before, be at home yet remain connected in real time across the planet. Perspectives change with the position. The visibility is much more from the top of the mountain but the details get blurred. Products and solutions are designed and positioned to meet the global and local requirements of the users. Personal and organisational positioning precedes and influences the process. A critical mass of catalytic material, individuals and organisations are a transformational imperative. Positioning is about those life changing decisions, the raison d’etre, like choosing a vocation and deciding to be best the in that vocation. The child in the womb is blissfully unaware of its position. The terrorist is firm in his position that the other deserves death. The negotiator takes middle ground (yes and no, you and me) The catalysts take the fourth position, the home position or the lighthouse position where they are at home and anchored. Work transforms to living, expression of one’s self. Here is the birth of the fully functional self, the beginning of conscious evolution, characterised by dynamic mental maps, flow, synchronicity and continual renewal. Now, one can fix the direction for the journey (continual improvement) connect with the home position to the variant position/s (reflect) and be certain that one is on course. Evolutionary growth and true community is in emergence. When we are confronted with problems with our tools we go back to the design – the user manual. Our tools have become very refined yet the problems continue to outpace them. When we don’t understand the basic design we become slaves to our own tools. Nature has a design, a deep structure, which we have to live with. We continue to pay a price for our ignorance of the basic design. Our designs are but improvisations of bits and bytes of the basic design. Imagine billions of people continuing with a flat earth worldview and the reality we collectively create! While we have ‘progressed’ we have also ‘regressed’ in our connectedness with nature. Deep down we still hold on to the flat earth static models. Better maps would facilitate faster and sustained improvements by leveraging technology and markets which work in real time and help us to make more intelligent use of these levers. We have very sophisticated tools for spatial navigation ranging from the compass/ GPS to satellites and communication systems. We have mapped our immediate environs with greater and greater precision and managed to connect machines to communicate with each other across the planet in real- time. For the first time we see the planet in real time. Though machines communicate with each other we do not do it as well. The man machine interface is still a grey area which slows down the common journey. A real time evolutionary framework of wholeness is one of the requirements to bridge the divides and disconnects. Now imagine the sheet being transformed into a perfect football. What happens to the centre? The centre is shifted to the centre of the football and the football is being kicked around in the world-cup with no timelines. It is a perfect football. Nothing happens to the centre. It remains at the centre absolutely centred, motionless and at peace. Sometime during the process of being kicked around the football becomes aware of what is going on. Instead of being chased around it decides to chase the players! Imagine your own self, the conflicts and the process of becoming anchored, taking the lighthouse position and the beginning of the journey of sustained continuous improvement. What is the first thing that we need to know if we want to reach your destination? We may have to ask more questions before we come to the answer.? That was the birth of your body. You didn’t have anything much to do with it and you are not your 60 Kgs. Are you suggesting that I am yet to be born? ‘WE’ are yet to be born. How can I be born if WE, the species, is yet to be born? The system at birth is comparable to the bullet that leaves the barrel of a gun. The bullet is helpless to influence its trajectory. Systems that we design do not go beyond this level though the duration could be much longer. Self-regulation is the differentiator to qualify to be a higher level system, evolving to become aware of the position, direction and regulating itself to influence the outcome choosing the course to the potential of the design. Soul is the unifying principle that, which connects, the glue, gives meaning, spirit. We haven’t really started. We are already getting mired in the semantic swamp. The semantic swamp contributes to global warming, cutting down more trees and creates more intellectual poverty rights. ∏ = synergy, whole > the sum of parts, dynamic, continual, real time, unending, quality of being connected with the centre and the periphery ( the perfect foot-ball). When the setting is right, the intent is expressed, the seed turns into the tree, caterpillar to the butterfly and the bullet is aware of its self, takes birth to eternity. The journey begins here, that of transformation. “Well-nigh two thousand years and not a single new god”- Nietzsche. Oneness is the quality of the whole – the child in the womb is one with the mother and at birth is confronted by the separation, a perceived duality which is the quality of two, a linear world of many, day and night, good or bad, true or false, yes or no – the domain of problems. The prodigal son revolts, eventually reconciles. The self evolves to resolve the contradictions, duality and recognise the connectedness – oneness. This is not a return in the sense of going back since the self has moved to a higher level in terms of growth and maturity from the level of yes or no, true or false to the level of yes and no, true and false , good and bad. This is the quality of three – trinity, the third position from which agreement, improvement and solutions are possible, the shift from the static and linear to the dynamic and static. Intelligent choices and conscious evolution follow. Which is true north, the direction for the journey? Do we have a map of every-THING, to make it easier and fool proof? J. The learning engine (LE) is any system that continually improves on its previous best performance. J. You can be one. It involves taking the (home) position that you are one knowing what it means to be one. In the same way if a team, an organisation, or a community decides to be one, it certainly qualifies to be a LE. S. Besides taking position what more does it involve? J. It involves understanding the design and matching the performance with the design. Windows take us to the world of the digital. This window to the self has four panes giving us the four perspectives from the centre. It took over three decades to see the connection with the four lions around the centre which communicates the essence of the four-fold view of the wheel of dharma. 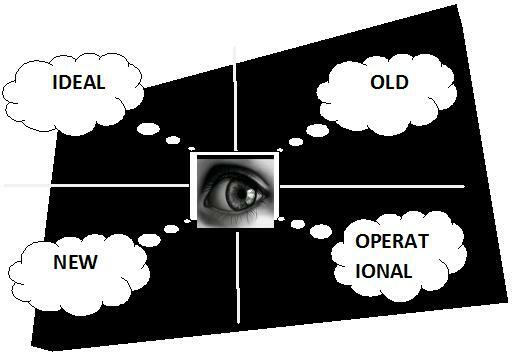 J. Quadrants, the four panes of the window, Q1, Q2, Q3, and Q4 of the LE are analogous to the four wheels of the car and the eye, the centre, the anchor, home position or whatever – a non-controversial reference point for metrics. The four quadrants are also directional. S. Who is the driver? J. Us, depending on whoever identifies with the system. Q1 and Q 4 are internal to the observer, driver/s of the LE. Q2, Q3 are external to the observer. 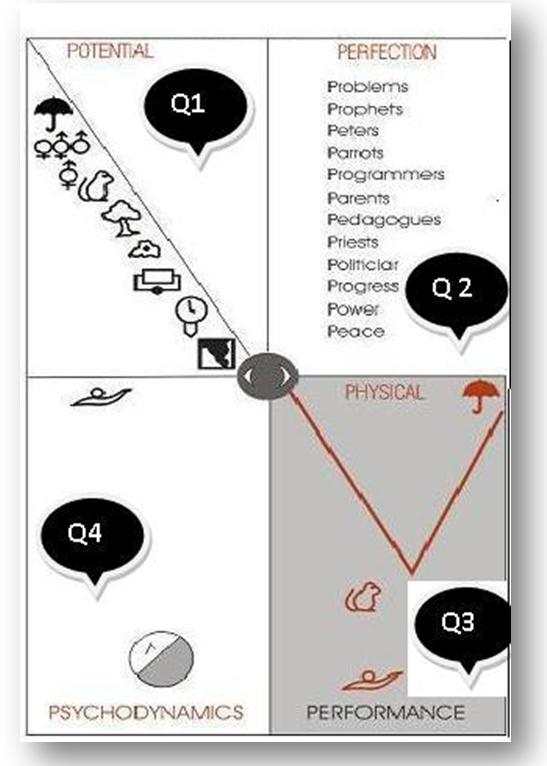 Q 3 is the physical world. At the centre, where the four quadrants meet, imagine a lighthouse with nine levels. When you climb to the top you get the eagle’s perspective, see everything and have a map of everything. The gap is the waste, unrealised potential, road not travelled, blue ocean space, the domain for Metrics. The direction for the journey can now be set, the compass function – towards bridging the gap between potential and performance. Had there been no gap we would have had a straight line in quadrant SE, a mirror image of NW. The gap is the waste, unrealised potential, road not travelled, blue ocean space, the domain for Metrics, inputs for course correction, to make sure that the journey is one of improvement rather than speeding towards disaster. Quadrant NW is the external social system, history, barriers to transcend, opportunities which conflicts with SW in terms of the challenges to learning and improvement. Programmers, Parents, Pedagogues, Priests, Politicians – Even children are trained/ programmed to be terrorists- parroting. Why not programming for sustained improvements? The major programming influences, family, religion, politics groom to conform. It is for the individual to discern between the chaff and the grain in his journey of improvement. Progress – Many a measure of progress fail to capture net improvements in realising the unrealised potential of the human. 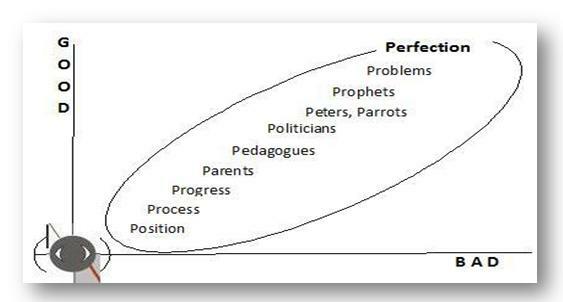 What we might think as progress may not be an improvement as suggested in quadrant SW. We might believe us to be above the level of animals as a class, but when it comes to realising potential we fall below them. Power, Peace – Aggression begets aggression. Authentic power follows from facilitating others to discover their power, voice, potential, anchoring and connecting to peace within for peace outside. Process – The focus on events, outcome and results need to go hand in hand with process dimensions. The product is in the process. If output and results do not meet expectations and standards, revisit the process. Continual Renewal – Continual learning is the path to continual renewal. Nature is in a process of continual renewal but for the ecological footprints from human interventions. It takes more than a year for nature to renew what we consume in a year and some damages are irreparable. Learning improves our mental models. The frog in the well forms a model of the world. The eagle on the tree has a different model. When the frog is taken out by the eagle and brought back into the well these two merge together to form a map of the world. The world has not changed but the models of the world have changed. We too had a flat earth model in the not too distant past. With better technology and tools these models have given way to maps with increasing precision. Though maps of the physical world have become more precise the mental models that went with them are not easily discarded. The map to attenuates variety in sufficient measure to reveals what is concealed It facilitates positioning, fixing direction and self-correction for the process of continual renewal and improvement at different levels – individual, institutions, communities and community. 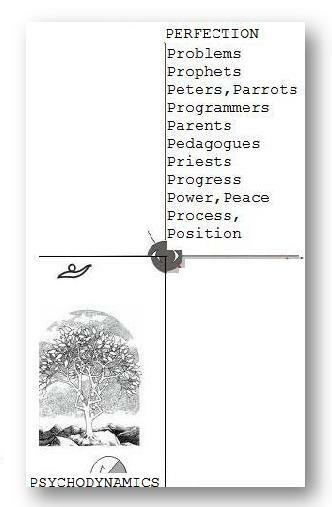 We know where to hang our different hats as practitioners of various disciplines, ‘social programmers’ – parents, pedagogues, priests, and politicians. We can SEE and SHOW (the visual has the highest bandwidth) how everything, living, non-living, internal and external, observer- observed are ONE, a continuum, in process and evolving. 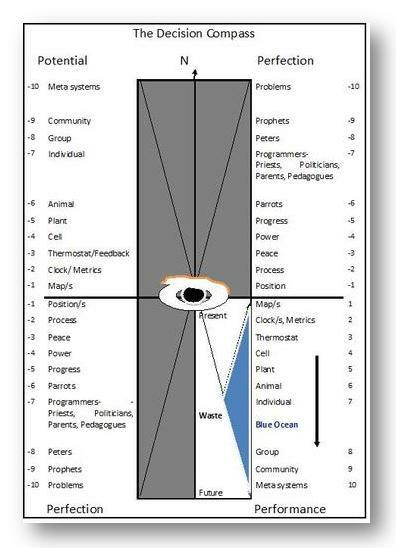 It points to the blue ocean space, the un- trodden path to our evolutionary potential. The observer could be the individual, a group, an organisation or the species. The wheels must be in alignment for the car to move on. There exists a perennial conflict (resistance to change) between quadrants NW and SE, ideal and the operational, between internal self and the external social system, quadrants SW and NE. To manage is to create, sustain and continually improve the alignment so that the car is on course feeding on its fuel – waste. Corresponding to the total potential/performance gap, there exists a gap in every one of us which forms the personal sphere for improvement which triggers the question, “What is my potential and my performance? Quadrant NW represents the ideal, perfect, conceptual, pure potential, internal to the self and in perfect alignment at all levels starting from the maps to Meta systems (represented by the umbrella). 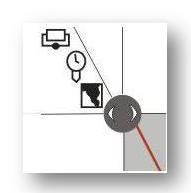 The map facilitates positioning, fixing the direction for the journey and measurement of progress. It is possible to visualise the nature of the journey as an on – going process of continual improvement and renewal. To take that first step we need to know where our position is and the direction in which to take that step, to be on course. The potential performance gap is illustrated by life expectancy vs. longevity of exceptional people. Life expectancy in developed countries is around 75 which is an indication of performance. Potential is reflected in the exceptions, people living beyond their 100. The gap or the waste in terms of unrealised potential is 25 years. Life expectancy is not the only aspect to be taken into account. There are exceptions who achieve much more than average people with shorter life spans and those who continue to be much more productive in their second careers than in their first. The third head is the clock. One needs to keep some measure of the progress, keep counting, have some tools, technology, etc to go on the journey. Without tools where would we be? We could at best walk 20 miles a day and that would be the limit of our potential to travel for a day. In the last one decade, our internal landscapes have broadened much more than in any time during recorded history. Level of the cell, the basic unit of the body, a virus or bacteria, a higher level system than a clock, or thermostat, beginning of life as we understand it . Where would we be without our understanding of the cell? We need all the ten heads to be fully functional. Think of it as a ladder with 10 steps. Take away any one, potential is a myth. Being positioned /anchored is to place the ladder on firm ground and go up to take the eagle’s perspective. Another way to visualise it, is to see it as a lighthouse with ten levels each level corresponding to the steps of the ladder. The lighthouse does not change its position, but the sailing vessels do have to if they are not to perish. “ Dasavataram “ stands for the ten avatars of Vishnu, the ten stages of evolution of the human.It is also the title of a recent movie by Kamal Hassan, the south Indian actor, who acts in ten different roles, avatars. Ramayana is the epic journey of Rama. (Ayanam is journey). The anti hero – is Ravana (An Asura) with ten heads who abducts Sita (the feminine) wife of Rama (masculine, an avatar of Vishnu). The choice is between turning into a 10 headed monster or to the truly human positioned to realise the design, the higher unrealised human potential. One needs to take a conscious choice to by the design than against it. Knowing the design is a required condition. Who wants to grow into a monster intentionally? Not even Hitler would! Why is it that there is such variance? If we visualize a future society with 100 yrs as the norm, there is a waste of 25 years. Why do such variances occur and how do you explain the gap between potential and performance? We take the two panes together so that the contrast helps us to grasp the nature of the problem, like black vs. white a duality. We hold the view that a duality is nothing but a gate to learning. The potential quadrant is of a conceptual nature whereas the performance quadrant is the tangible physical world as in design of a car and the car. Ground zero is the meeting point between all quadrants the position of the observer symbolised by the eye/ self. Potential is emergent from positioning and alignment with all levels. InRamayana, the journey of Rama, Ravana, the anti- hero has ten heads (nine more heads within) corresponding to all the levels, yet he fails to win the heroine. 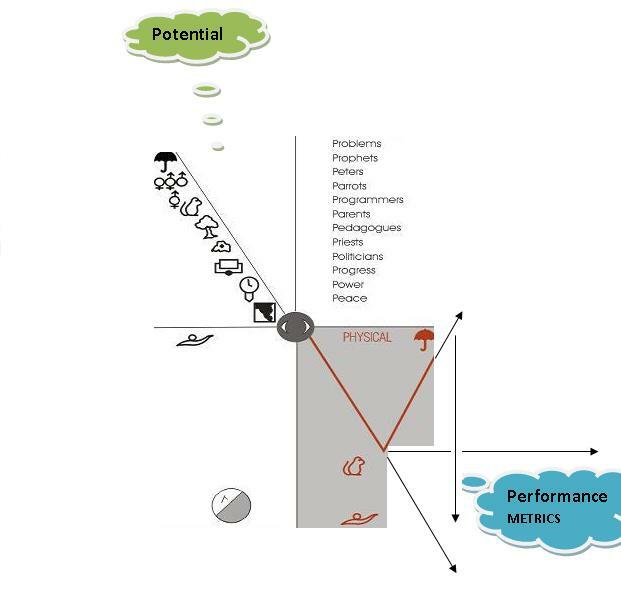 In the performance quadrant the gap between potential and performance begins from the level of the human. We can improve, but do not in aggregate terms. The blue ocean space is the collective unrealised potential of the system or in other words, the waste. Metrics deals with the reduction in waste (pollution, illness, suicides) the measure of net improvements, real progress, the reduction in the gap between potential and performance. The journey is in the right direction if continual renewal / improvement results. Discipline comes very close to it. The question is about my position then, what is your “nishtha”, position, in space and time, now? My profile gives shows my location as Bangalore. So the question is not about my physical location. She is referring to my growing up as a person, my journey. We need to ask more questions to give an answer to the question, Where am I ? The first question on any journey- outside, inside, inside out, outside inside. The second question is where do I want to go – the direction of the journey. The third is how do I make sure that I am on course – am I moving in the direction that I wanted to go and not speeding towards disaster. 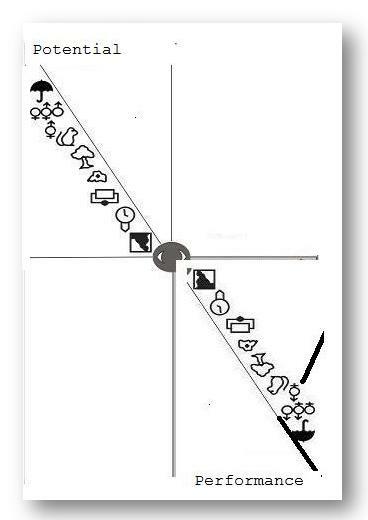 This is what a GPS or compass facilitates in our regular journeys. So where am I now? I need to look back – where was I? 1949, physical birth, bullet that left the barrel of the gun – have written about it earlier, a low level system without self regulation. 1981, takes the lighthouse position, the invariant one, the Facilitator. I am my position (Peter M Senge) I have not shifted from this position since. But I have other variant positions like the ship in relation to the lighthouse. 1981-90, I was busy making a map for the journey, a tool that help me answer the three questions, ‘The Map of Everything’. From 1990, I am on the journey better ‘equipped’. That leaves room for more questions. Where were you before? Where will you be in 2049? – Centenary of the bullet? Sergey Bubka is my mental map for being positioned and ALIGNED for continual improvement. The link takes you to a visual of Sergey standing poised with the pole for the leap. We also have a female version in the making in Yelena Isinbaeva. Sergey is not just another sports person. He continues to do what he did in the field in other realms. The pole vaulter leverages the pole against the threshold to cross over and does it over and over to set new heights of performance. He is positioned and aligned to perform. Every pole vaulter does the same, but Sergey is the exception. So what goes into positioning and alignment and leveraging is much more than a question of mechanical advantage. We take our cars to check for alignment. One could think of a similar service for people, organisations, communities and community (for the species). The threshold level of performance is the benchmark against which positioning and alignment are tested and the proof of the pudding is in the eating – better and better results. We can learn a lot from the animals about positioning and alignment. It is natural to them. For us it is not natural, it is a matter of choice. Freewill has its disadvantages too. We see what we pay attention to. What we choose to focus on is limited by the program which runs us and the positions we take which most likely has nothing to do with the common good. We could be charging full steam towards our own destruction. This possibility no more exists with the emergence of the matrix which has taken over the collective unconscious. Since the year of the matrix, 1990, 5169 Neos have been trained in the matrix. Somewhere in between, the 100th monkey effect took over and the program now exists in everyone. The Neos are conscious of the existence of the matrix. Others are not. Some Neos work as teachers and healers, in food and livelihood security, software engineering, and in medicine.